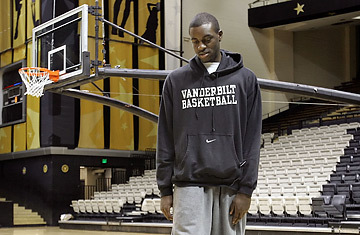 Vanderbilt basketball player Davis Nwankwo photographed on the spot where he collapsed due to an enlarged heart, during a practice on March 6, 2006 in Nashville, Tenn. It happens all too often; every three days to be exact. In the middle of throwing a curveball or catching a pass, a young athlete dies of sudden cardiac arrest  an abrupt loss of heart function that affects more than 400,000 people in the U.S. and is the leading cause of death in competitive athletes. Every so often, we hear about it on the news. A young man or woman who appears to be the picture of health and vigor has their life tragically cut short. But in reality, these incidents happen more than we realize and are possibly preventable. For years, the medical community has thought that only about 20 fatal cases of sudden cardiac arrest occurred each year in the U.S. among young athletes. But new research presented in November 2006 by Dr. Barry Maron, director of the Hypertrophic Cardiomyopathy Center at the Minneapolis Heart Institute Foundation, at the American Heart Association conference shows that the number of deaths among those athletes under 35 is nearly six times higher. "This is still an underestimate," Maron says. "It is real public health problem." And those are just the cases we know about: the ones that are picked up by local TV stations and printed in the newspaper. In the absence of a government subsidized national registry, there is no telling just how high the number really is. The disease itself is as mysterious as its incidence. Unlike many heart problems indicated by symptoms or murmurs, the conditions that cause sudden cardiac arrest usually do not show up during a physical or an athletic screening. That was certainly the case for Davis Nwankwo, a basketball player from Vanderbilt University who collapsed suddenly last year during practice and was found later to have hypertrophic cardiomyopathy, a condition that causes the heart muscles to thicken. "There were no warning signs at all," says Michael Meyer, an athletic trainer who saved Nwankwo's life using an automatic external defibrillator (AED), a portable electronic device that stops cardiac arrhythmia by shocking the heart. In the absence of symptoms, 95% of all sudden cardiac arrest victims will die on the scene. You can try to call for help, but in these dire cases, there isn't much time. It takes the average Emergency Medical Service team approximately 6 to 12 minutes to respond to any type of call, but with every minute that passes the chance of survival of sudden cardiac arrest decreases by 7 to 10%, according to the American Heart Association. As a result, the U.S. National Athletic Trainer's Association and the Inter-Association Task Force recently recommended in the Journal of Athletic Training that every school in the country, public and private, have an AED on site. "We all wear life vests in the water, just in case something crazy does happen," says Chuck Kimmel, the President of the National Athletic Trainers' Association. "The AED is the cardiac life vest." And it works. More than 70% of all sudden cardiac arrest victims are saved by defibrillators. Laura Friend, the cofounder of Parent Heart Watch, an advocacy group that helps to raise awareness and protect children from sudden cardiac death, knows that percentage all too well. Three years ago, she lost her 12-year-old daughter Sarah at a water park in Texas from the same condition as Nwankwo's. An AED might have saved Sarah's life. "It is an epidemic," Friend says. "When are we going to realize we are losing too many kids?" Only nine states have laws in place that require an AED in any type of school. And most of those laws only apply to high schools, not colleges or universities. Struck by the deaths of four children in only two months last September and a total 15 deaths that same year, Texas recently passed the most comprehensive AED bill in the country, requiring every private, elementary, middle and high school in the state to have a defibrillator and a staff member trained to use it. "When the sixteenth child was saved by a defibrillator, the Governor finally woke up and said we do have a problem," Friend says. More importantly, the Texas bill also requires that the AED be available in a reasonable amount of time and be within reach of the athletes. "An AED only answers half of the problem if is locked away in the nurse's office," says Dr. Jonathan Drezner, co-chair of the Inter-Association Task Force Consensus Statement. "I see cases all the time where an athlete collapses and the school doesn't know where the AED is." So what's the holdup? Like most problems, it boils down to simple dollars and cents. Schools just don't want to pay the money. The average AED now costs about $1,500 and some are even available for less than a grand. But buying the equipment isn't the only hurdle, they also need to train someone to use it. "Money is a big problem," says Vanderbilt's Meyer, whose college has since bought ten additional defibrillators. In Nwankwo's case, it was a small price to pay. The Vanderbilt junior, who still plays on the team and helps coach, says: "It could happen anytime to anyone." Watch TIME's video "A Free Lesson With Kobe Bryant."